Today Edward Teach, better known as "Blackbeard," is perhaps the best-known non-fictional pirate even though he was not the most successful. He is remembered mainly because of his image that he himself helped to create. Teach's life story is basically only known within the few years before his death when he was a pirate. His previous origins are unknown but it is believed that he was born in Bristol around 1680. His true identity is not entirely known either, but "Edward Teach" is recognized as being his standard name. Other forms of his last name were commonly cited in letters of the day - "Thatch," "Tach," "Tash," and even "Drummond" to list a few. It is believed that he was a well-educated man since he could read/write and papers were found on him after his death. It is reasonable to believe that he wished to keep his true identity secret to protect his relatives at home, so "Edward Teach" may have been just an alias. to those that cooperated with him, but at the same time he did not waste time with those who fought him or did not cooperate with him. There is a story of a man that refused to give Blackbeard his jewelry so rather than fighting with him, Blackbeard simply cut the man's hand off. Unlike some other pirates, Teach was not known to be a very barbaric and demented pirate who tortured victims for fun, but instead he usually just went after valuables. His demonic image he created actually added to the stories of his wickedness. Teach was also apparently a ladies man, as it is said that he had around 14 wives. He treated women kindly and fell in love easily and treated each like his first love. Only his last marriage to a 16-year-old young lady (thought to be Mary Ormond) is believed to be legitimate since he was properly married, but this happened during his last year of his life. His previous marriages were conducted on board his ship and were almost a commonplace ritual to the crew. In 1716, Teach began his pirating career when he met the well-known pirate Benjamin Hornigold at New Providence. Hornigold took Teach on as an apprentice and he proved to be a quick study. Sometime in early 1717, Hornigold gave Teach his own command of a sloop and together they wrecked havoc in the following months. Later in the year, off of the island of St. Vincent, the two pirate sloops closed on a merchantman and soon captured it. The ship was a large Dutch-built French guineaman named Concord, which Teach had a liking for. Hornigold allowed him to claim this prize ship as Teach's new command. Hornigold decided to retire from pirating since the English King offered a pardon for pirates, so now Teach was on his own. The Concord was re-christened Queen Anne's Revenge and fashioned into a pirate ship by installing about 40 guns. With such a large and well-armed ship as this, Teach would began his notorious pirate career. Soon after he set sail again, Teach and his crew sighted another large merchantman off St. Vincet named Great Allen. The Great Allen eventually surrendered and Teach cleaned the ship of valuables and set her on fire after putting the crew ashore. News of this engagement soon spread and in a few days Queen Anne's Revenge came across the British 30-gunned man-of-war HMS Scarborough, which was sent out to deal with the prospering pirate. Rather than run from the warship, which he could have done with his faster ship, Teach decided to battle the man-of-war since he never ran away from a battle. A running duel soon started that lasted hours, and the British warship was decidedly losing the fight to the skillful pirate crew. The British captain realized this and began to withdraw which Teach allowed since there would be no real use for continuing the attack on the warship since it would not be carrying any cargo that the pirates sought. Teach's reputation increased dramatically after this incident - a pirate that can defeat a British man-of-war deserves respect. Teach soon began to increase his reputation once again by creating his well-known Blackbeard persona. He knew that if he looked frightening then ships might surrender to him sooner. He let his hair grow and started a beard that would almost cover his face. He twisted his long hair and beard in pigtails and he was known to tie colored ribbons on the ends. During battle he put lit slow burning hemp cord under his hat near his ears that would smoke and envelop him in a cloud. To add to his menacing appearance he also wore several pistols (as much as six) along with his knives and cutlass at his waist. 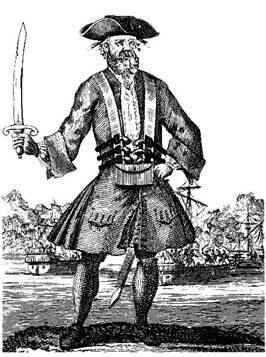 He himself created the name "Blackbeard" and soon his frightful image was well known. While in battle the opposing crew often surrendered at the mere sight of him in a rage, some even called him the Devil-incarnate. Obviously Teach's Blackbeard persona worked!  The fear his new image created had the psychological effect he wanted. In May 1718, Blackbeard's pirate fleets appeared at Charleston, South Carolina. Soon they were stopping every vessel entering and leaving the harbor. Almost ten vessels were plundered before Charleston acted on the reoccurring problem. All incoming vessels were soon diverted from entering Charleston harbor and all vessels already within the harbor remained in port because of the siege from Blackbeard's fleet. Before this happened though, Blackbeard was able to take many important high-ranking citizens as prisoners hoping they would be useful. He held them for ransom for medical supplies and threatened to kill them all if he did not get his wish. Several days after sending one of the hostages and two of his crew to deliver the ransom note, he received his medical trunk and true to his word he released all the prisoners without a loss of life. Now it was time for Blackbeard to retire from pirating and take advantage of the same pardon Hornigold took earlier. But before he would do this, Blackbeard came up with a devious plan to let him and a select few of his crew (about 40 men) keep the most valuable plunder. He would load one ship with the best treasure and leave the rest of the crew behind - now all he needed to do was to execute his plan. At Topsail Inlet (now known as Beaufort Inlet), North Carolina, Queen Anne's Revenge "accidentally" ran aground on a sandbar and Blackbeard called Israel Hands aboard Adventure to help him free the ship; and in the process, Hands also ran "accidentally" aground. Teach then told Bonnet that he should seek the pardon too and the Major agreed, especially after Teach promised that he would return to him the command of Revenge. Shortly after, Bonnet and some of his crew left on a small boat for the acceptance of the pardon at nearby Bath, NC. In the meantime, Teach set the rest of his plan in motion - he began to load all of the valuables onto Adventure. When about 25 men of the crew realized what was really happening, he simply marooned them as he set sail with the fully treasure-laden Adventure. Meanwhile, Bonnet received his pardon and papers needed for Revenge and returned to the scene. There he found his ship waiting for him as expected, but very unexpectedly all the valuables were gone. 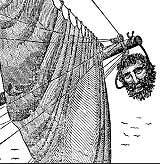 He soon found the marooned men and vowed revenge on Blackbeard of this treachery, but he was unsuccessful at ever catching him. Blackbeard and his men went to receive their pardons from North Carolina Governor Charles Eden and Teach soon settled in Bath Town. Eden and Teach spent much time together so it is believed Eden had access to Blackbeard's loot since the two become friends. Teach eventually met his last wife here while in his retirement, and this time around the governor legally married them. By mid 1718, the pirate life soon tempted Blackbeard back to his old trade and he was once again off-and-on pirating, although at times he tried to cover it up. While off Ocracoke Island in September 1718, Blackbeard spotted another pirate again, this time Charles Vane (in a few months a crewman on Vane's ship, Jack Rackham or "Calico Jack", would supercede him.) The two pirate ships saluted each other and soon the two crews gathered for a few days of typical pirate celebrating. Soon citizens and neighboring Virginia Governor Alexander Spotswood feared the large gathering of pirates and rumors began to spread that a planned pirate haven would be set up. Spotswood began to organize a military force to rid Blackbeard. HMS Pearl and HMS Lyme were selected for the task but their captains informed the governor that their large ships would not be able to navigate the waters. Spotswood then offered up his own money to lease two sloops for the specific job, Ranger and Jane, which would be crewed by the warship men. First lieutenant Robert Maynard of HMS Pearl was selected to lead the two ships for the hunt while Captain Brand of HMS Lyme would lead ground forces.